Hundreds more apartments are set to get the green light as part of a bid to kickstart work on a stalled ‘masterplan’ scheme near Sheffield city centre. Proposals to build two interlinked blocks of flats catering for more than 300 students on Radford Street in Netherthorpe, the site of the old St Philips Social Club close to Sheffield University, go before the city council’s planning committee on Tuesday, and are recommended for approval. Despite concerns being raised over the high number of one-bedroom units included in the designs, planning officers have highlighted the ‘wider regeneration benefits’ which would come from allowing the development. Five years ago outline permission was granted for a project off Netherthorpe Road called Westgate, consisting of private and student accommodation, as well as offices. Plans held out the prospect of 500 jobs and envisaged just 85 flats for students, with 125 private apartments aimed at ‘key workers’ such as teachers, police and medical staff. A third building would have offered 11,500 sq metres of offices. Agents Deloitte say the scheme - which stalled when the recession hit - will act as a ‘catalyst for development’ and want construction to start this summer. The outline consent for Westgate lapsed last week - however, an application to renew it has been submitted and is currently under consideration. More than 300 bed spaces are proposed across the two blocks within 192 units. There would be 151 one-bed studio apartments, 12 two-bedroom units, six three-bedroom flats and 23 cluster units. In a report to the committee, planning officers say: “Although this mix is not ideal, the applicant has made a case that identifies the benefit of allowing this vacant site to be developed. It has also been made clear that any dilution in the proposed mix will result in the site being left vacant owing to the current market conditions. The scheme has won the backing of the Sheffield Chamber of Commerce. In a representation to councillors, the chamber’s executive director Richard Wright said: “As the student population in the city continues to increase, it is important to ensure good-quality private accomodation is provided, alongside the two universities’ own residential portfolio. Students make a significant contribution to the Sheffield economy and help to maintain many thriving businesses. He cited The Diamond - Sheffield University’s new £81 million engineering building - as an example of such an investment. Meanwhile committee members are also recommended to approve an application to revamp Provincial House - a Grade II listed building yards away from Radford Street, at the junction of Garden Street and Solly Street - as well as build three blocks of three, four and five storeys to create 107 studio apartments. 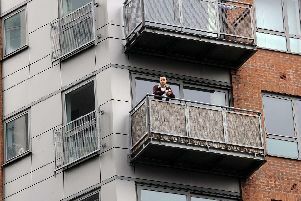 The flats are described as being for ‘residential’ use, rather than being specifically aimed at students. Provincial House was built in 1878 as a presbytery for the nearby St Vincent’s church.